The Binghamton men’s basketball team’s seven-game winning streak is over after suffering an 85-60 road loss to Penn State on Tuesday night. It had been the Bearcats’ longest streak since the 2008-09 season when BU (8-5) captured its only America East (AE) Championship and advanced to the NCAA Tournament. The Nittany Lions (10-3) began the game with an 8-0 run, and led for most of the match. Near the midpoint of the half, a 3-pointer by Show tied the game at 16, and soon after, a trey by redshirt freshman guard Tyler Stewart gave BU a short-lived 19-16 edge. But this was Binghamton’s only lead of the game. The first half concluded with a score of 39-36 in favor of Penn State. The second half performances by both squads mirrored those of the first. Penn State jumped out to several leads, but the Bearcats continued to compete to keep themselves in the game. Until the final minutes, the Nittany Lions’ largest advantage was 12 points. With just over five minutes remaining in the game, Bruce drove to the basket and sunk a layup to cut Penn State’s lead to eight, 68-60. Penn State then took control of the game from that point on, ultimately winning 80-65. Show once again led the Bearcats in scoring with 13 points, while Stewart contributed 12 points. Bruce picked up a team-high nine boards. Despite the loss, Binghamton is in good shape as it nears the beginning of conference play. With just two nonconference matchups remaining, the Bearcats have the second-best record among their AE counterparts. Only Albany (11-2) has more victories. At this point last season, BU held the same 8-5 record and ultimately finished its nonconference season at 9-6. But a season-ending injury to redshirt junior guard J.C. Show hurt Binghamton in AE play, where the Bearcats finished near the bottom of the standings. Binghamton entered its match against Penn State after Sacred Heart on the road Sunday, 51-48. Junior guard J.C. Show’s go-ahead three with 1:36 remaining allowed the Bearcats to win the defensive battle. BU’s defensive anchor, junior forward Thomas Bruce, led the way for the team, logging 12 total rebounds, three blocks and two steals. Show was the Bearcats’ leading scorer with 21 points. 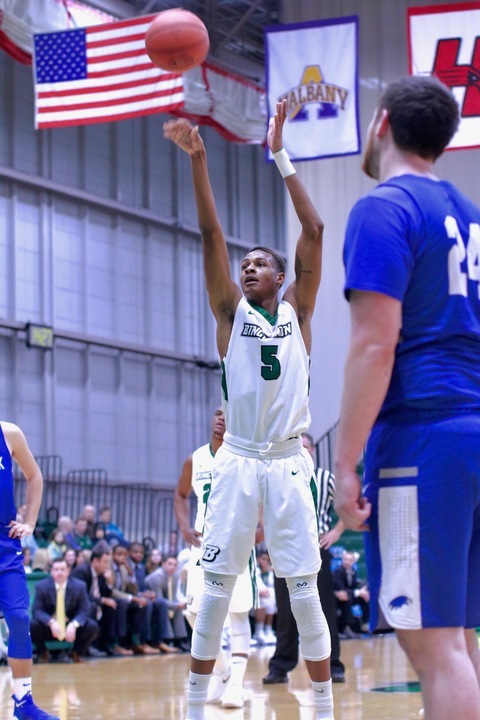 Binghamton is set to return home for its upcoming match against LIU Brooklyn. Tipoff is scheduled for 7 p.m. on Friday, Dec. 22 from the Events Center in Vestal, New York.